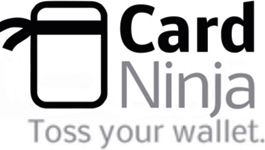 We carry around a lot of stuff - some absolutely necessary (driver's license/ID, credit card) and some just junk (dry cleaner receipts, reward cards, business cards). I have long been on a journey to apply the principles of minimalism and 'Use less stuff' to this portable closet, the wallet. I used to conduct 'Wallet checks' in class - all the guys (I never had the courage to begin to go through a woman's purse - holy crap hoarder!) would get out their wallets and I would ask them to take everything out and then I would question them: Why do you have a months-old receipt? Why 3 cards for one store? Why a coupon that has probly now expired? Almost every wallet owner admitted they could purge some crap out of their pockets - useless stuff they carried around with them all the time. Many years ago, I would ruthlessly purge crap that I carried around. Did I really need all this stuff? I used the same attitude I used when purging crap in my house and office. Just the necessities. Move some stuff to a more efficient location or throw it away. Purging even further, did I really need things in my wallet that I could keep in my car? It was similar to my new MacBook Air with no disc drive - I use a disc drive about 6 times a year but was carrying around the drive every day with my computer. 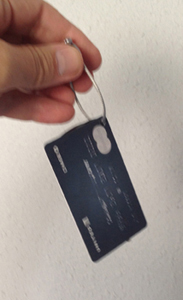 I was carrying around those wallet cards several times a day even though I only used them every few weeks. That makes no sense. • Keep a folder in the car to hold maps, insurance info, parking permit, insurance card, video rental cards, reward cards, and museum membership cards (I always drive to the museum and video rental store). I do have to lock my car because of the exposed iPod, so the cards are both hidden and locked in the car. 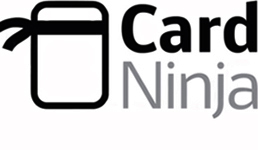 • I input my dental/med info into my phone which is always with me. Also in my phone: AAA info, license plate number, and any other info I might need easy access to. All this info is backed up on my home computer and on a hard copy printout. 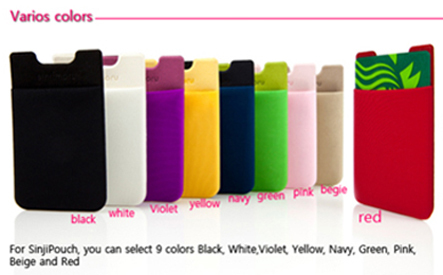 • Cut out all the other wallet pockets and windows to reduce bulk. 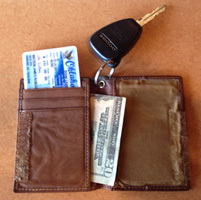 • The key attached to the wallet means I can't forget my wallet when driving. I look forward to using my phone for all purchases (not just Starbucks) so I can get rid of the one credit card in my wallet. That day is coming soon. This is a store-bought wallet with all unnecessary slots and pockets removed - I performed surgery with a seam cutter and an x-acto knife until I had the wallet down to just the necessary pockets. 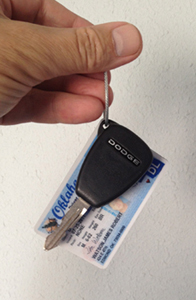 I did like having my car key attached to my wallet - I am less likely to forget my wallet when its attached and, in the car, my wallet is out and dangling from the ignition hole - I don't have to fumble in my pants pocket to access the cards. But, most wallets don't have a corner grommet - much of my searching was for such a grommet. To earn as many airline miles as possible, I got in the routine of charging every purchase. Literally, every one. At first, I might get a disapproving look from a cashier for charging 2 rolls of mints. But not anymore, for several reasons: the swipe machines have gotten easier, no signature is necessary for certain amounts, and more and more people pay by card. I still kept some cash in my wallet, for use in an emergency (although I'm not real sure what would constitute a must-have-cash emergency.) Recently, I realized any such emergency would likely be while in my car. So simple - keep the cash stash hidden in the car. No need to carry it around with me all day for a possible use every few months. My phone is always with me - I have no land line and I use the Calendar and To Do List functions throughout the day. It helps keep my life organized. And simplified. Those reward cards? All thrown away. Most places just key in my phone number to access my frequent-user account. Insurance info is in my phone (the official card is still in the car for the police officer), I pay for Starbucks with their app and some restaurants in NYC with the LevelUp app. 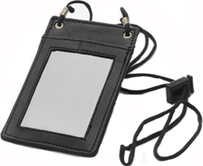 A while back, I bought an ID holder from a street vendor in SoHo for $2.00 (he wanted 3). 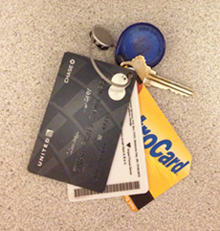 I removed the neck lanyard and the holder worked well - cards in one pocket on one side, cash in the other, and a grommet to attach the key ring. 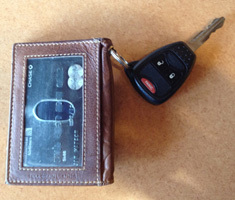 This worked well, it was my favorite wallet, but, since it was only $2 on the street, it didn't last too long. It might have lasted longer as an ID holder around someone's neck, but not so much in my pants pocket and being handled multiple times a day. 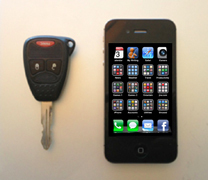 November 3, 2012: While having Margaritas with Sean (another strive-to-be minimalist), we discussed how the iPhone was lightening the load in our wallets. I got out the contents of my wallet (ID holder) and laid them out on the table. He casually mentioned that I could just put holes in the cards and bind the cards and key together. Eureka. That's just what I did that evening. We searched key ring options at Ace Hardware (they have everything). I bought several that might work. 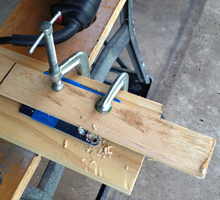 I clamped my two cards together and drilled a small hole in the corner. 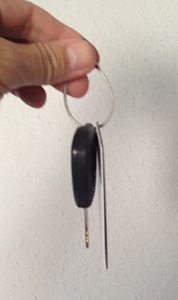 This particular ring allows easy, but secure, removal of an item in case I need to leave the car key at a garage or repair shop or hand the credit card to someone. So far, the usage test has been positive - the sensitive areas of the cards, the magnetic strip and bar code, face each other for protection; the card strip is accessible for swiping in every machine so far, both the side swipes and the slot inserts. I drilled a hole in the MetroCard in the corner that would allow the magnetic stripe to be protected against the other cards. 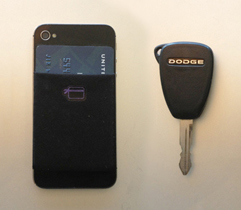 Yep, that's it - a car key and a credit card in a sleeve on the back of my phone. I keep some cash and my Driver's License in the car (where I may need it). For several months now, I have not needed to use any cash. 1. The cards slide into the sleeve vertically. 2. 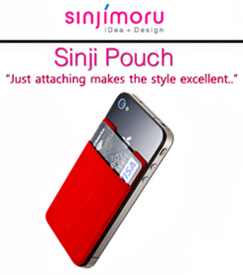 The sleeve, cards, and phone are shown vertically in the product images. 3. A human face with a headband is more of a vertical shape than horizontal. I had to overlook the poor translation (Just attaching makes the style excellent. ), misspelling (varios), and poor typo proofing (White,Violet). The word 'wallet' has been in use since the late 1300s to refer to a bag or a knapsack for carrying articles. The word may derive from Proto-Germanic. The ancient Greek word kibisis, said to describe the sack carried by the god Hermes and the sack in which the mythical hero Perseus carried the decapitated head of the monster Medusa, has been typically translated as 'wallet'. Usage of the term 'wallet' in its modern meaning of 'flat case for carrying paper currency' in American English dates to 1834 but this meaning was one of many in the 19th century and early 20th century. The wallet was the poor man's portable larder; or the thing that you stocked with provisions. Sometimes a man may be eating out of it directly but the most characteristic references allude to its being 'replenished as a store', not in the manner of a lunch basket but more as a survival pack. As metals became increasingly used as currencies, wallets began taking shape to include coins, and in some cases, statements of accounts. In addition to money or currency, a wallet would also be used for carrying dried meat, victuals, and 'treasures'. The modern bi-fold wallet with multiple 'card slots' became standardized in the early 1950s with the introduction of the first credit cards.